Today's Twinsie post is a very special one for my twin & I as we are celebrating a 1 year Friendaversary it is amazing how quick a year goes by when you are having fun an sharing it with special people. For this post, we dicided to use the polish that basically started our friendship. Essence Blue Ray from the Holographics collection, I found these at a local grocery store and I posted a picture and Maria as the "blue" lover she is, wanted one and contacted me about it and we have been talking ever since! I think it is pretty safe to say we have texted eachother basically everyday for the past year or so, we have shared so much from anything to everything! One of the best things I have found in this blogging world is this friendship, so happy to have you a friend Maria :) your friendship means a lot to me, thanks for always listening to my crazy stories and for your support, luv ya bish! This polish is pretty, but it is very hard to capture, it has a duochrome effect, NOT HOLO, as you would think by the name of the collection "Holographics", but anyways...I decided to keep it simple and not cover much of the polish! Can't wait to see my twins mani.. check it out at Nails Made Simple!!! WTF? Friendaversary? Can't say I've ever heard of that before-but congrats? I love the idea and the accent is really beautiful. You two are so awesome, I love looking at your Twinsie Friday posts because it's just you two! Happy Friend-versary! What a sweet story - thanks for sharing. Love it! You are right on trend, rivets are hot for fall and I love them! 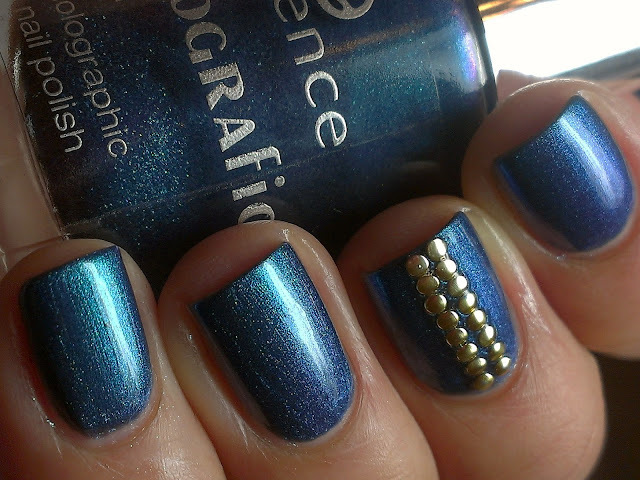 For the record: Essence does NOT understand the difference between 'holo' and 'duochrome'. They say all their duochromes like Where is the Party? are holos when they are indeed duochrome. I remember seeing this LE and was initially drawn to it but after the first reviews and once in front of the display, I thought it was so-so. awww i love ya too bish! I can't wwait till next year for vegas! woot woot! This is beautiful! The studs look amazing! Congrats on your frendaversary! You both are so sweet! Love the mani, such a pretty color. So awesome how you both met! This is a really lovely color! I love the studs! This is gorgeous! I love those studs! Such a lovely post: I like your manicure so much! !